Last night I finally received my much awaited package of Save the Date invitations. I wanted something special, interactive and that captured our quirky personalities with a touch of casual sophistication. 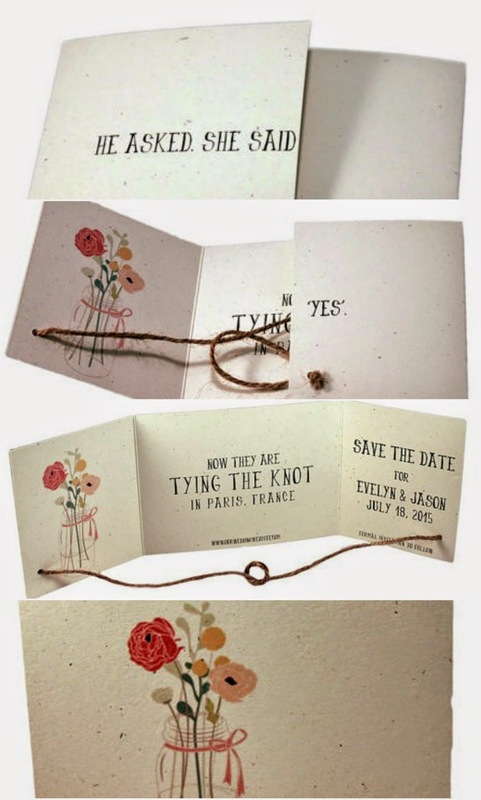 That's when I came across these invites from SweetSights on Etsy. I loved how cute and simply stated it was... and the actual tied knot that happens when guests open it up was the perfect touch! I plan on printing out mailing labels this weekend and mailing them off next week! Now that my Save the Dates are on their way to mailboxes, my mother in law, Marnee, and maid of honor, Melissa, are anxious to start planning the bridal showers they have graciously offered to host. I'm excited about the showers since I never had one before and it will be great to get together with my dear friends and family. I'm especially happy that Marnee has scheduled the shower she is hosting when my mom will be visiting. Melissa is being super secretive about her shower plans... and she knows how hard it is for me to not jump into the whole party planning because I love planning parties to begin with. Regardless, I know these amazing women will throw a memorable experience for me and cannot wait! 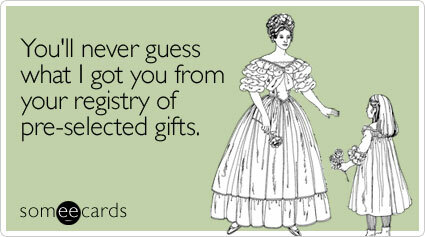 Initially we didn't plan on registering for gifts and opted to have a honeymoon registry instead. But since we have showers planned, my hostesses suggested that it might be a good idea to have a bridal registry available. We pretty much have everything we need, but we managed to build a registry with items we wouldn't mind replacing or upgrading to. That said, it was fun to work on our registry together. So we're pretty much done with our registries! Well that's it for this month's wedding tasks. Not too terribly busy - which is great! - but it boggles my mind how quickly our wedding day is approaching. Stay tuned for next month's update on how our wedding planning and preparations are coming along!